I designed this a very long time ago, but I never posted the files. Every so often someone asks me for them. It is a fan mount that can attach either to your X carriage or to a RepRap Mendel's X carriage. Thanks to StefanHH for his original ball socket design! 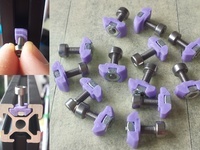 Ball-mounts.stl contains two different mounts and a fan connector. 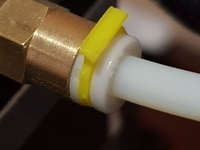 The bolt hole for the fan connector is M3. 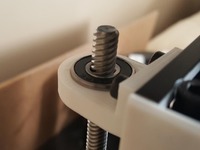 The hole for the X carriage mount (the one with the single hole and the flat board sticking out of it) is an M4, and if you attach a slightly longer m4 bolt to a MakerGear Prusa X Carriage, you can slide this on and secure it with a wingnut. The wires run neatly down the inside of the ball sockets. You are going to need to print several of the ball sockets. I think I printed a 4 x 5 multiply of the BallSocketSR.stl. Note, the ball socket I created has a slightly bigger diameter sphere to it than StefanHH's original ball socket. I found the bigger diameter added more grip to keep the chain in place. 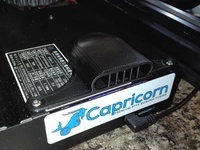 The fan attaches with an M3 bolt. If you don't want the fan attached to the X carriage, you can attach it to the threaded rods using the included 3rd mount. It connect in the same way as a Prusa endstop mount. I recommend Printing in ABS, as PLA will loosen up over time (I think because of the heat emanating from the build surface).